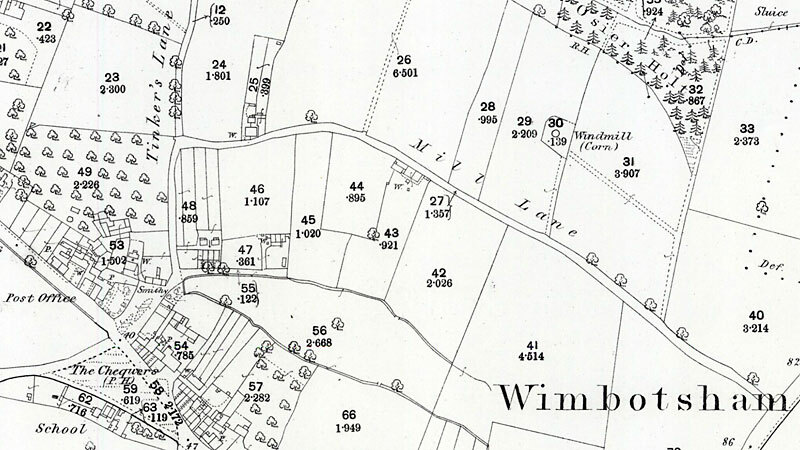 Wimbotsham towermill stood on the north side of Miller's Lane. The small red brick mill had 3 storeys with an ogee cap. A tailpole from the cap ended with a 2 ft. diameter 4 ins. wide cast iron wheel set to run on a track around the mill. The sails that drove 2 pairs of stones, came down to within reach of a person on the ground. Wanted, a MAN to take charge of a Grist Mill and make himself generally useful. One into years preferred. Apply at Mr. R. B. Towler's, Wimbotsham, near Downham Market. When the Slubberdike Plantation was planted to the north of the mill,it robbed the mill of much of its wind, eventually rendering it unprofitable as a business. Ironically it was a gale on Sunday 16th March 1913 between midday and 1.00pm that ended the mill's life. The mill was tailwinded and as a result, the cap and sails were blown off. After the mill was put out of action it was suggested that it should be converted top residential use. However, the prospective tenant's wife indignantly rejected the idea. The tenant was the groom to the local vicar. The mill was subsequently sold to a demolition contractor who dismantled it.soon after. On 25th October 1980, Lewis R. Turner of Gayton wrote to Harry Apling to provide information from P. J, Boughen a retired builder from Wimbotsham. It was mentioned that the mill had been out of use for some years (probably by at least 1904) before being put beyond repair by the gale of 1913. The miller was reported as being one Harry Lee and could well have been a relation of George Lee, who was listed as the miller in charge. The mill machinery was dismantled by a millwright '...who makes a living going round taking down old windmills.' Bricklayers from the estate then demolished the mill tower.